President Donald Trump is fuming over a U.S.-bound migrant caravan. Over the course of the past week, he’s posted 15 tweets about the caravan, estimated to consist of as many as 7,000 people, that left from San Pedro Sula, Honduras, earlier this month and has been growing along the way. Trump has placed blame on Democrats, threatened to cut aid to Honduras, Guatemala, and El Salvador, and urged an overhaul of the nation’s immigration laws despite Congress being out of session. He called the caravan an “assault on our country” at a rally Monday night in Houston and said the “Democrats had something to do with” it. Earlier in the day, Trump had pledged to cut off or “substantially” reduce foreign aid to the Northern Triangle countries. Trump’s calls to action on immigration aren’t new. He campaigned on the issue in 2016 and has continued to push for his border wall since taking office. But it’s moments such as these, when images of thousands of migrants are broadcast across networks, that spark the president’s outrage and produce reactions that are highly problematic. Witness what happened in April, the last time a caravan from Latin America was headed north and the Trump administration implemented a policy called “zero tolerance” in hopes of deterring people from journeying to the southern border. Events since then have shown that this approach lacked nuance, triggered national and international outrage, and fell far short of addressing the deep-rooted problems that are causing people to migrate. “I think the idea from the Trump administration that you can somehow just stop people from coming by either threatening to cut off the aid—which basically goes to the government, not to the people that are fleeing—or by believing you can close off borders is not going to really address why people are very willing to get up from one day to the next, it seems, and travel north with the hope for a better life,” said Maureen Meyer, the director for Mexico and migrant rights at the Washington Office on Latin America, an advocacy organization. A key aspect of the “zero tolerance” policy that greeted the April caravan’s arrival called for the prosecution of adults crossing the border illegally. After pleading guilty to illegal entry—which is a misdemeanor—migrants were sentenced to time served and, later, processed for deportation. But this was the problem: “Criminalizing” border crossing necessitated family separation—because children by law couldn’t be kept in federal jail. Attorney General Jeff Sessions described the situation at the time as “a crisis … that necessitates an escalated effort to prosecute those who choose to illegally cross our border.” Trump, under intense political pressure, eventually ended the policy, which had led to roughly 2,000 separated families, through an executive order in June. But even “zero tolerance” and family separation haven’t stemmed the flow of migrants from El Salvador, Honduras, and Guatemala. After prosecuting those illegally crossing the border, Sessions sought in June to make it much harder for migrants to be granted asylum: He reversed an immigration-appeals-court ruling and said that domestic abuse and gang violence no longer qualified as grounds for asylum. The ruling immediately undercut the claims of many migrants from Latin America, where gang violence is endemic. The administration has also recently been floating a number of possible new policies aimed at deterring migrants, one of which would include forcing parents who cross the border illegally with their children to give them up to foster care or be detained together, according to mediareports. The goal is clear: to discourage migrants from coming to the United States. Former President Barack Obama also tried to stem the flow of immigrants journeying to the U.S.-Mexico border with threats of detention. He, too, discovered that deterrence policies usually fail in the face of economic distress and violence. To that end, in 2016, then–Secretary of State John Kerry announced a plan that, with the help of the United Nations, would identify people eligible for refugee status in El Salvador, Guatemala, and Honduras. 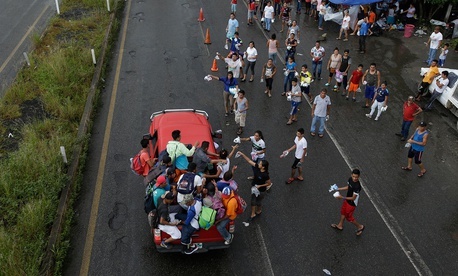 Those who were fleeing imminent danger would be placed in Costa Rica for processing. The administration also expanded the Central American minors program to include siblings, parents, and caregivers accompanying minors. “It was limited in scope but it’s certainly tried to create legal ways for a small but growing population of people that were in dire need of protection,” Meyer said, noting that it wasn’t a long-term solution. The Trump administration ended the program in August 2017. “This population is not trying to evade capture at the border,” said John Sandweg, who served as a counselor to then-Secretary of Homeland Security Janet Napolitano and as the acting director of ice from 2013 to 2014. “These people are surrendering when they cross the border.” This is a stark difference from pre-2014, when largely Mexican nationals were trying to evade U.S. officials when crossing the border, Sandweg noted. Now that the Trump administration is no longer separating migrant children from their parents, it has run headlong into another legal impediment: a 1997 consent decree known as the Flores agreement, which says that children cannot be kept in immigration detention for longer than 20 days. Administration officials have taken steps to withdraw from the agreement without effect. The administration is also reportedly considering ways to deport people more quickly and extend the use of ankle monitors, which have been used to track immigrants awaiting their hearings. Sandweg agrees that deportation might work as a deterrent, but that, too, requires time and resources. Immigrant advocates have meanwhile argued for the continued aid to the Northern Triangle countries and fair hearings for immigrants seeking asylum that would allow them to cite fears of gang and domestic violence. The conservative Heritage Foundation, for one, has warned about the consequences of cutting aid to Mexico, Guatemala, Honduras, and El Salvador.